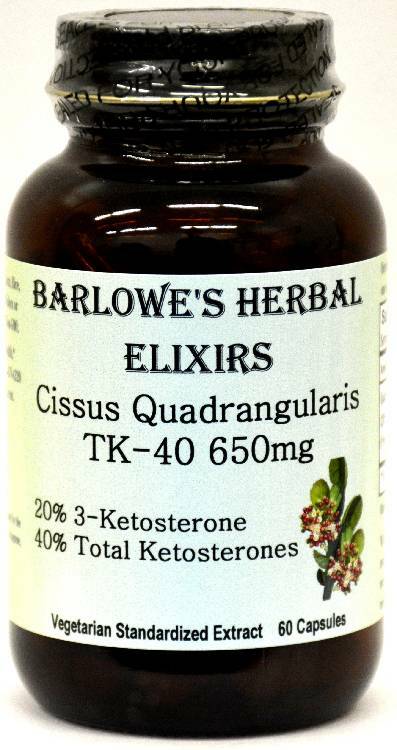 Barlowe's Herbal Elixirs proudly offers TK-40 Cissus Quadrangularis Extract, containing 20% 3-Ketosterone and 40% total Ketosterones. Cissus Quadrangularis has been a staple of Indian Ayurvedic Medicine for millenia. It is now available to athletes, bodybuilders and anyone else who wants to support joint and bone health. Bottled in Glass! No Stearates! No Fillers! No Junk! 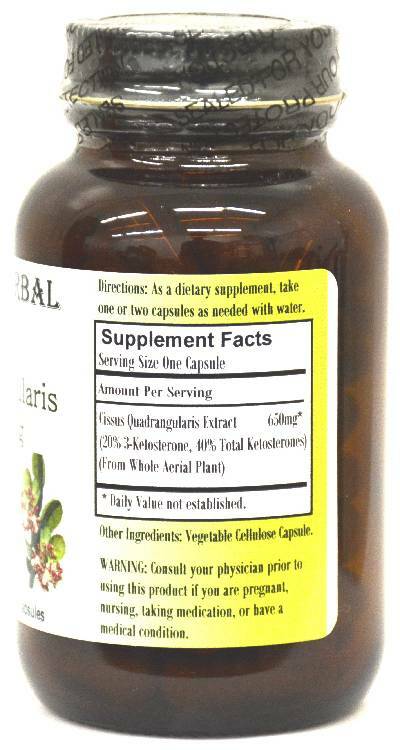 Barlowe's Herbal Elixirs proudly offers TK-40 Cissus Quadrangularis Extract, containing 20% 3-Ketosterone and 40% total Ketosterones. Cissus Quadrangularis has been a staple of Indian Ayurvedic Medicine for millenia. Researchers have discovered the power of this potent herbal remedy. It is now available to athletes, bodybuilders and anyone else who wants to support joint and bone health. Cissus supports healthy muscles, bones and helps deliver nutrients to tendons. 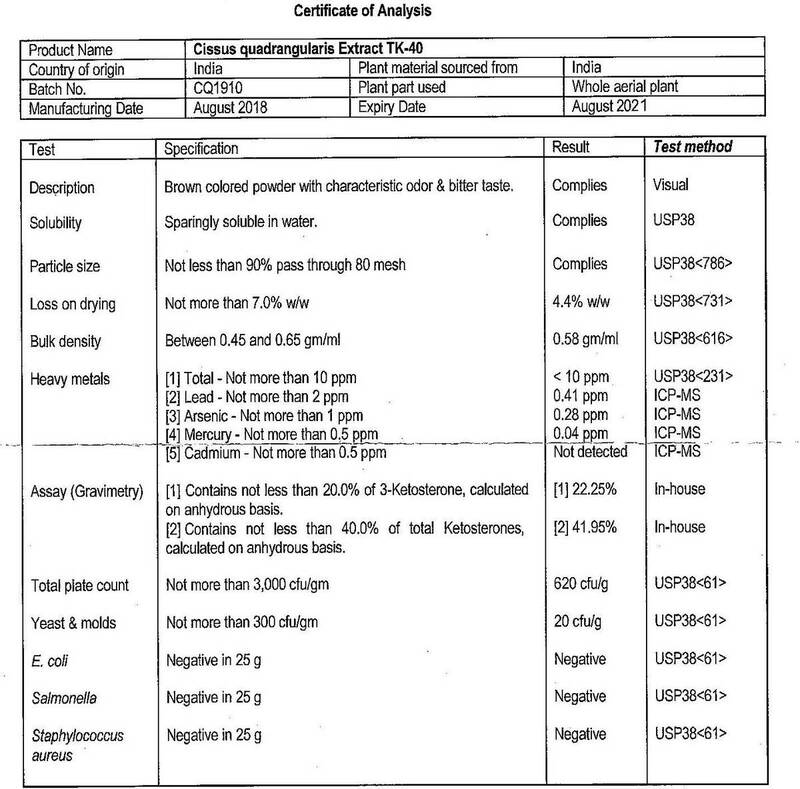 The Cissus Quadrangularis Certificate of Analysis (COA) for this particular batch is shown above. Bottled in Glass! No Stearates! No Fillers! No Junk! Cissus is great for bone and joint health. Its name in India "asthisamharaka" translates as "that which prevents the destruction of bones". Cissus Quadrangularis has also been found to be quite useful in weight loss programs as it helps control appetite and normalizes the metabolism. It has strong analgesis and anti-inflammatory properties, and it helps protect the lining of the stomach. Caution: Barlowe's Cissus Quadrangularis Extract is generally safe, but it is potent and should be utilized with care. This product is for dietary use. If unexpected side-effects occur, discontinue use immediately! The above statements have not been evaluated by the Food and Drug Administration (FDA). This product is not intended to diagnose, treat, cure, or prevent any disease. Directions For Use: Take two or more capsules daily on an empty stomach for bone and joint health. For some people, dosage may need to be increased as results and usage amounts vary based on body type and weight.